What is a Wisconsin Eviction Notice? Wisconsin Eviction Notice: What Is It? A Wisconsin eviction notice being created and legally served is the first step a landlord or their authorized agent must take in the legal eviction process. Until it is served and the tenant refuses to comply with it, the landlord cannot file an eviction lawsuit. Eviction notices, often referred to as a notice to quit or a notice to vacate, must comply with the state’s landlord-tenant laws. What Are the Components of a Wisconsin Eviction Notice? The name of the eviction notice. This usually includes the reason the eviction notice was issued and the number of days (provided by law) that the tenant has to either correct the problem or vacate the property. The name of the tenant who signed the lease or rental agreement. What the tenant needs to do and the number of days they have to do it in. The name and contact information of the landlord or their agent. The signature of the landlord or the agent. The landlord or the agent issuing the eviction notice may also find it helpful to create a Certificate of Service to document the service process. This includes the date of service, the name of the person served, how service occurred, and the signature of the person who served the eviction notice. The notice may be served in person on the tenant or a member of the residence who is at least 14 years old. If someone other than the tenant is served, the landlord must also send a copy of the eviction notice via certified mail. The notice may also be served using certified mail or being posted on the property in a place where it is easily seen such as the front door. A 5-day notice to cure or quit can be used for non-payment of rent or for other first time non-compliance violations according to § 704.17(2). This notice should detail the reason it was issued and give the tenant 5 days to take care of the issue or vacate the property. A 5-day notice to vacate for nuisance or criminal activity is authorized by § 704.17(1p)(c) and (3m). Landlords may use this notice to inform the tenant that they have 5 days to vacate the property because of nuisance or criminal activities taking place on the property. The landlord may want to detail the reason that the notice was issued. If the lease is violated in some way for a second time, it becomes an incurable violation. The tenant is given 14 days to vacate the property if the violation occurred within 12 months of the first. It can be used for non-payment of rent or another lease violation according to § 704.17(2)(b). The landlord may find it helpful to list the date of the first and second violation as well as detail the violation that occurred. A 28-day notice to terminate a month-to-month tenancy is a document that can be used by either a landlord or a tenant. 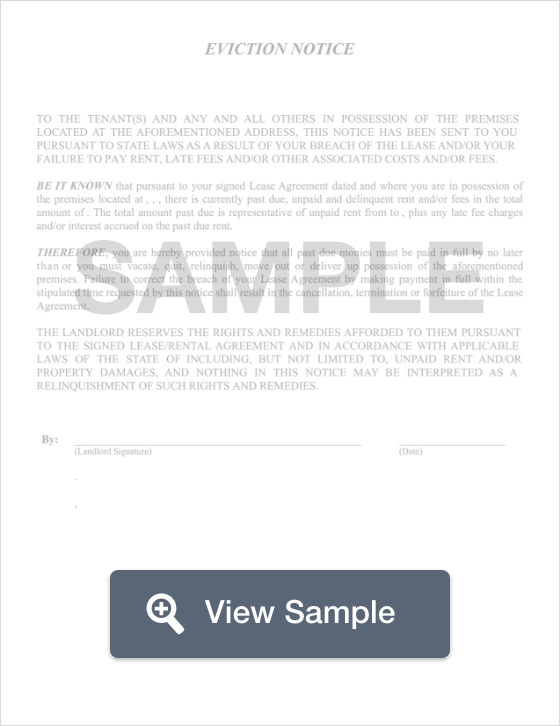 It informs the recipient that the property should be vacated at the end of the 28 day period. This notice is governed by § 704.19(3). What Are the Legal Considerations of a Wisconsin Eviction Notice? A Wisconsin eviction notice is the first action that must be taken in the legal eviction process. The landlord must have the tenant legally served, and the tenant must refuse to comply before the landlord can file an eviction lawsuit. If the landlord doesn’t have a court order, they may not change the locks or lock out the tenant in any way, turn off the utilities to the property, or remove the belongings of the tenant. Doing so without a court order is illegal. Landlords may not attempt to evict a tenant for reporting the property to the housing authorities because of code violations or inhabitable conditions. The landlord may not evict the tenant because of their disability, religion, family status, gender, skin color, race, or home country. Landlords who use illegal eviction methods may be sued by the tenant. The court may order the landlord to pay the tenant financial compensation. The landlord may also be fined for breaking state and / or federal law. If you’re a tenant in Wisconsin, you have rights that you should know. You can find information about your rights by visiting the website of the Wisconsin Department of Agriculture, Trade, and Consumer Protection. If you receive an eviction notice, take the time to read it carefully. You need to know why it was issued and what you need to do. You also need to know how long you have to correct the problem or vacate the property. Make sure that you read the section above about the legal considerations of a Wisconsin eviction notice. You’ll learn a little about illegal evictions. If you believe that the eviction against you was illegal, you can talk to a landlord-tenant attorney to get an opinion on whether you have a legal claim against the landlord. If you do, you can learn about what your next step should be. A lawyer can also answer any questions you have about the eviction process. You can also contact legal aid or a law school in your area. Law schools sometimes offer legal clinics that provide legal advice to the public. There are several eviction notices for Wisconsin landlords to choose from. It’s important for landlords to choose the right eviction notice because it informs the tenant that a problem exists and that they only have a certain amount of time to fix the issue or leave the property. Eviction notices must be legally served on the tenant. We discussed acceptable service methods above. Tenants must refuse to comply with the eviction notice before the landlord can file a lawsuit against them. Without a court order, a landlord may not lock out the tenant, change the locks, disconnect the utilities, or remove the tenant’s belongings from the dwelling. Landlords should understand their options, obligations, and rights. To learn more, they can consult with a landlord-tenant lawyer in the county where the property is located.